Zappos, one of the largest online shoe and clothing retailers in the world, recently undertook a radical reorganization. It completely zapped its traditional organizational hierarchy in favor of a radically flat structure called a holacracy. Holy hierarchy, Batman, no bosses? That’s right, there is no “leader” per se (though you can bet that for external purposes, Tony Hsieh will still be considered the CEO), or even job titles, if you can imagine that. A holacracy takes a very different approach to structure, decision-making, and distribution of power. It’s a very transparent approach that focuses on the work that needs to be done rather than the people doing it. Holon is a Greek word that means both whole and part.The word Holarchy was first used by Arthur Koestler in his 1967 book, The Ghost in the Machine, as a way to describe something that is simultaneously a whole and a part. A unit or system may look like an autonomous whole, but upon closer examination it often turns out to also be part of an even larger system upon which it depends. Brian Robertson is credited with developing the concept of holacracy during his years as the founder of Ternary Software in Exton, PA. Rather than the traditional pyramid, the organizational structure of a holacracy is represented as various circles in a variety of relationships to each other, sometimes overlapping, sometimes nested within each other, and so on. It’s all about defining different roles and self-organizing to get things done to close the gap between the way things are the ways they could be better. It owes a lot to Robertson’s experiences in agile software development. There have been any number of organizations that have converted to holacratic structures, but for the most part they tend to be on the small end of the spectrum in terms of size – companies like Precision Nutrition, The David Allen Company, both around 50 employees. Twitter co-founder Ev William’s new blog company, Medium, has adopted it as well for its 73 employees. Then there’s the world’s largest tomato processing company, Morning Star, with 400 year-round employees. That makes Zappos, with more than 1,500 employees, the largest company to date to take on the holacratic structure. Zappos went for this unique structure because the company feared becoming overly bureaucratic as it continues to grow, and didn’t want bureaucracy to get in the way adapting to rapidly changing conditions while providing the excellent customer service its business model is built upon. The way this is panning out at Zappos is that there will be about 400 circles, meaning teams of people who work together to fulfill the various roles in that circle. Employees have a high level of autonomy to select what roles they will work on, and it becomes quickly apparent who is slacking and who is not, so there’s an immediately higher level of accountability for productivity. You can’t hide behind a job title in a holacracy – you have to roll up your sleeves and get things done. The key to holacracy is in its meetings. There are tactical meetings where people can identify and process operational tensions, which means the gap between status quo and something better, and governance meetings where tensions around structure are processed. Learning professionals interested in holacratic structures take note: Employees have to be well-versed in negotiation and communication skills to make all this have any reasonable chance of succeeding. Because the system relies on distributed power, there is also training on how to exercise authority in appropriate ways – clearly a needed skill in a largely self-governing system. This includes studying up on group decision-making processes as well. 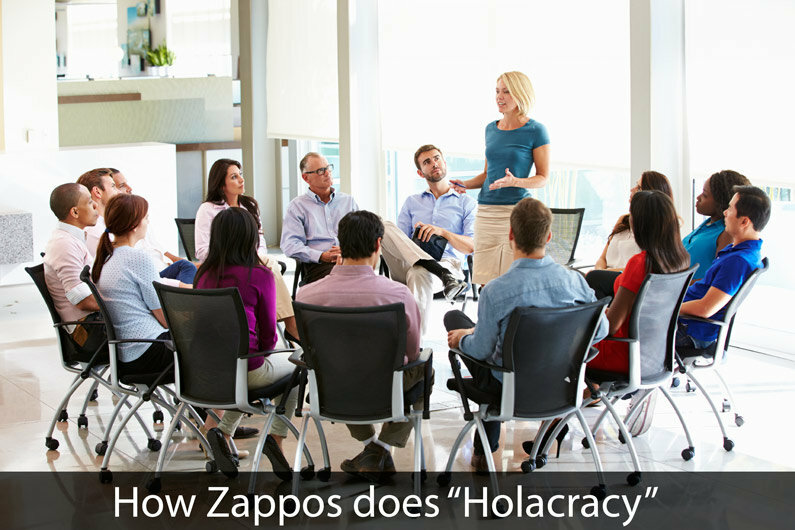 What will be interesting to see is whether or not holacracy works on this scale for Zappos, and how well it works. Only time will tell. How do you Overcome Tradition and Improve Productivity in Manufacturing?